The firestorm is set to purify again, with news that environmentally minded metalcore vets Earth Crisis are dropping a new album in 2014. The band's Salvation of Innocents arrives in North America on March 4 and a day earlier overseas via new label home Candlelight Records. A press release for the 12-song release notes that the Syracuse-formed unit produced the set themselves but had it mixed by Zeuss (Agnostic Front, Terror, Hatebreed). In addition to the new tunes, vocalist Karl Buechner's lyrics will tie in with an upcoming issue of Black Mask Studios' Liberator comic book. "The process for this album was new for us. We did most of it ourselves," guitarist Scott Crouse said in a statement. "The absence of pressure having to get things done by a certain time each day really gave us the freedom to try new ideas and critically listen to the songs. From the music, to the lyrical concept, to the comic book that brings the lyrics to life, we think we've created something pretty unique." 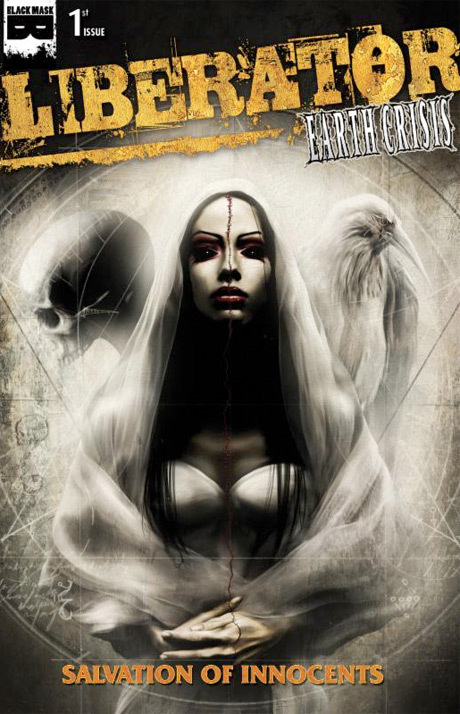 The vigilante series Liberator has apparently incorporated an anti-vivisection theme of the album into its fifth edition, with both project receiving cover art from illustrator Menton3. "It is crazy to me that it took twenty years for comics to produce a set of animal-minded vigilantes strong enough to roll with Earth Crisis. It is probably the most perfectly aligned superhero team-up ever," said Black Mask Studios co-founder Matt Pizzolo. As for the music, it will be another month before the band premiere Salvation of Innocents' lead single "The Morbid Glare" on January 21. On that day, they will launch a pre-order for the LP that will come with an immediate download of the single. According to Crouse, "The Morbid Glare" was a challenging track for the mosh-minded unit, as it is apparently performed using "the fastest tempo we've ever written at." "This is certainly new territory for us," he added. "Working at this speed was uncomfortable at times but we think the song really came out great in the end." Salvation of Innocents is Earth Crisis's first LP since 2011's Neutralize the Threat.